The War on Christmas is real and it’s happening at the Department of Motor Vehicles. Happily, Santa has won the most recent skirmish. Dave Reid is one of those guys who lives as Santa more-or-less year round. Reid has even gone so far as to tag his car with festive decals that read “North Pole” and “My Other Ride Is A Sleigh.” If stickers don’t convince you, Reid’s 1999 4Runner also features themed license plates. “Ho Ho,” they say, as though to indicate the driver is chuckling to himself as he spreads seasonal joy down the highway. The censored Santa was forced to take a standard tag home from the probate office that day, but he couldn’t let the issue go. Reid’s persistent complaints on the issue have had a happy outcome. WSFA contacted Alabama’s Department of Revenue on his behalf, and though they haven’t heard back, the attention of a local news affiliate has won the day. Reid was notified on Monday night that he’d ride with his Hos again. He was told he could pick up a temporary plate on Tuesday and should receive permanent ones with a couple weeks. 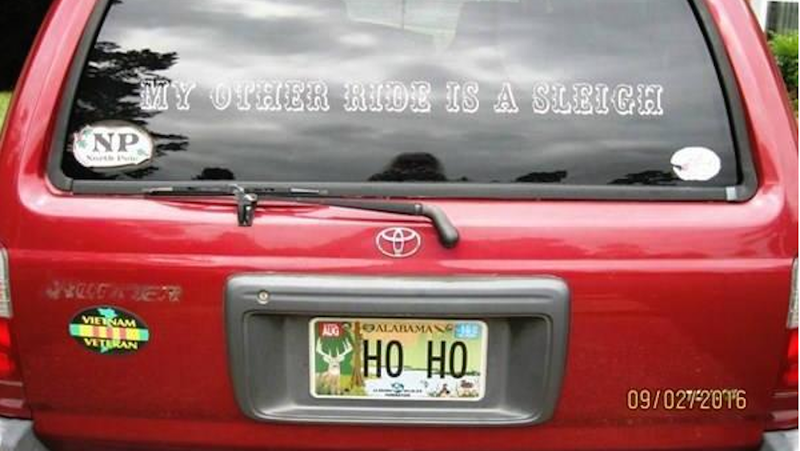 If Santa gets pulled over this Christmas, he’ll have his registration papers in order.